Ontario Parks has ended the Fire Ban for Algonquin Park as of 11:30am on August 14, 2016. Fires are now permitted in Algonquin Park. More than 34 millimetres of rain that fell at the East Gate on August 12-14, 2016. Park visitors are reminded to always use caution with fires, never leave fires unattended, and only light fires in designated areas. See the current Fire Danger Rating in Algonquin Park. If you have any questions regarding this notice, you may call the Park Information Office at 705 633-5572. Backcountry campsites on the following lakes that were closed for the human-caused High Falls Lake fire (APK020) have reopened as of August 16, 2016. See the Official Canoe Routes Map of Algonquin Park for locations. On August 9, 2016, Ontario Parks closed backcountry campsites as a result of a human-caused forest fire (APK020) in the vicinity of High Fall Lake (near the Sand Lake Gate). 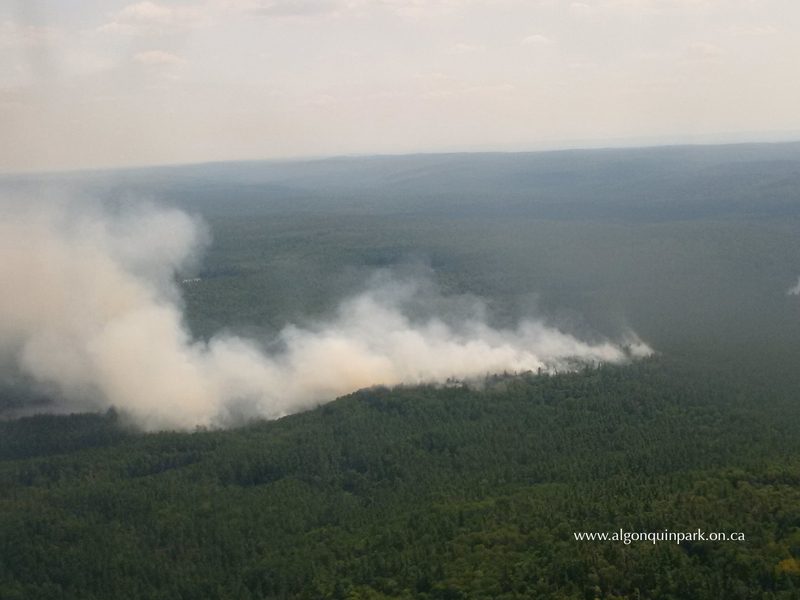 Algonquin Park 20, located near High Falls Lake has now been declared out. It reached a maximum size of 48 hectares (~119 acres). For more information see the AFFES Current Fire Status. As of August 14, 2016, Algonquin Park has had 21 fires during 2016 (20 declared "out" and one "active fire"). The total land area burnt by all fires is 53.3 hectares (~132 acres). Twelve of these fires were human-caused and 8 were caused by lightning (and one is yet to be determined). For updates see the Aviation, Forest Fire and Emergency Services website. A widely reported forest fire on Lake Opeongo (APK021) has been declared "out" by the Ministry of Natural Resources and Forestry's Aviation, Forest Fire and Emergency Services (AFFES). This	human-caused fire burnt 0.1 hectares (~0.25 acre) before being extinguished.